People Just Want To Have Fun! The River Rats Dueling Pianos are masters of interactive rock-n-roll comedy for any event. Corporate shows and private parties are not a side business for us; we specialize in bringing the fun anywhere! Whether it’s a large trade show, corporate meeting, wedding reception, fundraiser, comedy club, county fair, or community event, we bring customized entertainment that your guests will never forget. Ours is a request driven show that gets everyone involved. Your guests pick the songs, clap along, sing along, and become a part of their favorite music while we pound out the hits on grand pianos. A truly exciting, interactive experience. For more fun, contact us!! 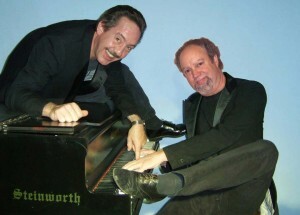 BOOK THE RIVER RATS DUELING PIANOS FOR YOUR NEXT BIG EVENT!